Blog | Being one of Europe's leading rug manufacturers for 30+ years means the Ornate family have tonnes of tips and trade secrets to share. We created this section to share news on our most exciting projects, collections and trade shows; plus an insight for decorators and designers into the interiors which inspire us. Colour reformed, reworked, overdyed;.. whatever name you choose to call them, this distinctive category of rugs are the embodiment of luxury and elegance, but they are as complexed to make as they are eye catching. 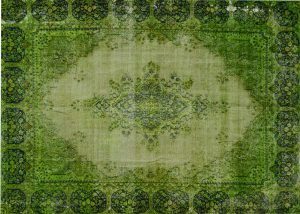 Their creation actually makes for quite an interesting tale; that’s why we’ve decided to fill you in on the lengthy process needed to produce our unique collection of reworked rugs, so you know just how special your over dyed purchase really is. It all starts back in the East where our agents travel with carpets and ask via loud speaker whether anyone would like to swap their old rugs for new ones. They only accept rugs which are between 10 to 50 years old. The rugs that make it through our strict vetting process are then brought into our factories, washed and dried several times, and finally de-coloured. Unlike other manufacturers we do not use any harmful chemicals during this process and pride ourselves on being a fully ethical company. Next, the new colour is applied. Whether it’s a gorgeous green, vibrant orange or a deeply intense blue is all dependant on the desires of our clients, sometimes the rugs are kept in its natural state, a lovely neutral cream. But whatever the colour is applied, you can rest assured that all dyes we use AZ0 (if you want a certificate to prove this we’ll happily provide one, just let us know). Once dying is done, the pile is trimmed off the rugs in certain areas, its this process that gives them the artistic look that we all know and love. The process is rounded off with any final repairs being made and the rug being stretched; then shipped over to our showroom in the UK and onto our lucky clients. So there you have it. A brief insight into the traditional art of over dying!